"SAIKIKO"（彩輝光） is a new technique of lacquerwork art, which is originally invented by a lacquerwork Makie Artist（蒔絵Artist） Kenji Omachi. 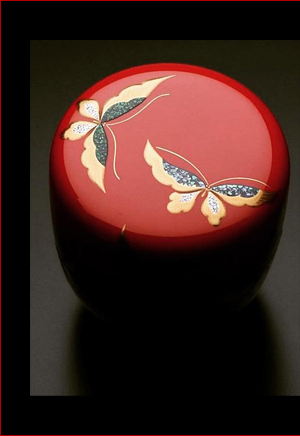 It is produced by applying "RADEN"（螺鈿）, one of traditional techniques of lacquerwork art. "RADEN" gave him a crucial hint, and the idea occurred to him use Kyoto opal in lacquerwork art. "SAIKIKO" brings out the best in the play of color unique on lacquer ware by attaching fractionized Kyoto opal to a material, intending to make a mosaic design, and by polishing topcoating lacquer. "SAIKIKO" was invented in a high developed sense of beauty by a combination between traditional technique which have been handed down in Kyoto from generation to generation and the new material made with the new technique. Copyright (C) Kenji Omachi All Rights Reserved.